I had been talking about living in the city so much that I completely forgot that my mum has a plot not too far out that yields a bit of fresh fruit now and then (not a grand farm or anything…excitement be reigned!). That is until she sent over a bunch of avocados. Now, understand that I had been on an avocado idea hunt since these eggs so the arrival of these impossibly dark burgundy globes was met with much delight. A big part of the harvest was, at C’s request, prepared simply with milk and sugar. This is actually a very common way of preparing avocado here, although perhaps a bit strange to those who’ve only had its savory incarnations. But really, I swear it, almost all children here remember this from their childhood…creamy avocado mashed with milk and sugar, and kept chilled in the fridge, or frozen in the freezer (a criminally simple “cheat’s” ice cream). But this isn’t about the buttery-sweet avocado pseudo-sorbet that is lounging in my freezer, though that would deserve more than some acclaim. This is about a fantastic avocado idea I found here. So simple, and so unequivocally good. If you are looking for a way to use your avocados this could be your new best friend. – Cook your cha soba as per package instructions. If the instructions are in Japanese, and you don’t read Japanese, then cook as you would regular pasta but only for about 5 minutes. Drain and immediately plunge into a bowl of ice water. Swish the noodles around a bit with your hand, and then drain again. – Place garlic, lemon juice, and olive oil into a food processor (I used my immersion blender) and process until smooth. Add the avocado and salt and process again until smooth and creamy. 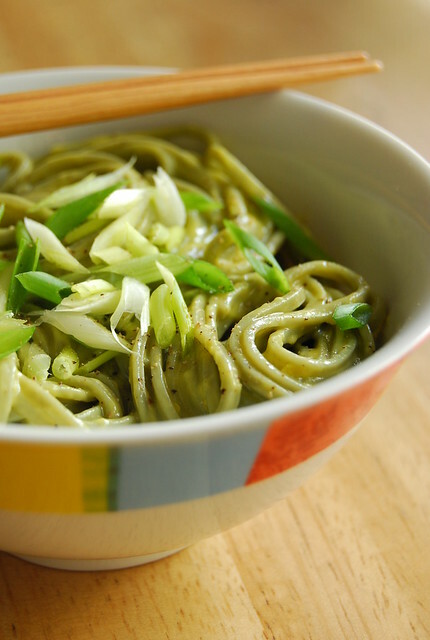 – Place your cooked and drained noodles in a bowl with the avocado sauce and toss until combined. Add lemon zest and pepper and toss again. Garnish with green onions. The minute I took a swipe of this sauce from the side of my stick blender with my finger I was hooked, lined, and totally sinker’d. Rich, silken, and garlicky. Like some divine avocado aioli. The original recipe includes an optional addition of basil which, as I didn’t have any on hand, I left out. I paired it instead with cha soba noodles and garnished it with green onions…changes that I think worked well. Although I know I will eventually try it with basil because doesn’t that sound just too delicious? It should be noted, as mentioned in the original, that the pasta does not reheat well due to the avocado in the sauce. I am happy to report though that I found a way to have this the next day. What I did was I only mixed enough pasta and sauce together for one serving. I stored the rest of the noodles and sauce in separate containers in the fridge. The next day I re-heated the noodles only. When the noodles are warm, toss with the sauce. Voila! I also tossed in some leftover salmon and it did splendidly. I am just back from a very full weekend at the beach with the lovely folks I work with. Lots of fun to say the least, but my weary limbs are calling for my blankies. Hope you had an equally gratifying weekend! And I hope you have spot of time, and an avocado, to try this dish soon! A beautiful and original soba dish! Marvelous. Creamy Avocado Soba? First time to hear about it but yeah why not right? My friends over here squirm when I tell them about avocado with sugar and milk and cubes of ice that we are used to over there. LOL! but this is something to try…really! i havent tried this, but interesting how u combine flavors in it.. it could be a good substitute of the usual cream on pasta.. great idea! Yummy! This looks so good. Lovely photo too. I saw Angela's recipe at OSG but hadn't tried it yet. Hi Malou! I know right…was just having some of that frozen avocado tonight and my hubs and I were wondering how people could not love it! Hi Sarah! Thank you 🙂 Do try it…it is lovely! I need to try Angela’s original version with the basil soon…I imagine it’s wonbderful! I read OhSheGlows and other US/Canada-based blogs and I am amazed that using avocados in dessert is not common. I've only been eating avocados in savory food for the past four years (favorite being sprinkling slices with salt flakes and muscovado) but this sounds so heavenly! More to make with avocado that is practically taking over my counter space! I love the avocado idea! I am so excited to see this recipe and can't wait to look for the special noodles. I love trying new flavors and this sounds fantastic. I worship avocados so know this will be divine! Hi Stargazer! I love avocado in its sweet preparation and really, I do think more people should explore that side of it 🙂 That being said, I love its savory side as well! Hi Paz! I love it too! 🙂 Hope you get to try it! Hi Luv’n Spoonfuls! You don’t need special noodles to do this…you can try it with regular pasta if you can find soba 🙂 Enjoy! I pretty much love every single ingredient in this dish. Indeed, a fantastic idea! This would be such a lovely starter for a weekend lunch – or supper in its entirety for one's lonesome. 😉 I love how the flavors of the cha soba and the avocado balance each other. It's my first time to comment. Homemade avocado ice cream just like how you described it Was very much part of my childhood. My non Pinoy friends shudder at the thought of avocado as a dessert. Hehe. Hi Marjorie! Thank you for your nice comment 🙂 This is really an interesting combination…and yummy too! Hi love cooking! I would have never thought of it either had it not been for Angela’s blog post…but it works so well! Hi Redmenace! I love everything that goes into it too 🙂 Which is why I so had to make it! Hi Midge! It does make a great solo supper…and yes, the cha soba and avocado flavors (and textures) balance each other out perfectly! Hi coffeewithamee! Thanks for stopping by and leaving a comment 🙂 I was honestly surprised when others would cringe at our sweetened avocado versions…it’s so good! Wow.. that is some new combination.. the picture says it all.. avocado is such a versatile fruit! This looks fantastic. Yum! Especially with avocado. Hi Richa! It truly is versatile! This is a delicious combination…hope you give it a try!